This year’s Super Bowl LII had more than 100 million viewers across the country. From watching first-time Super Bowl champs the Philadelphia Eagles upset the New England Patriots, to a dazzling halftime show starring Justin Timberlake and plenty of wacky TV ads, football fans had plenty of reasons to stay tuned in right through the end. But many were also tuning into their smartphones, especially before and after the game. 1. Sports fans shop early on game day. Before the game, shoppers clearly anticipated needing to buy items earlier in the day. 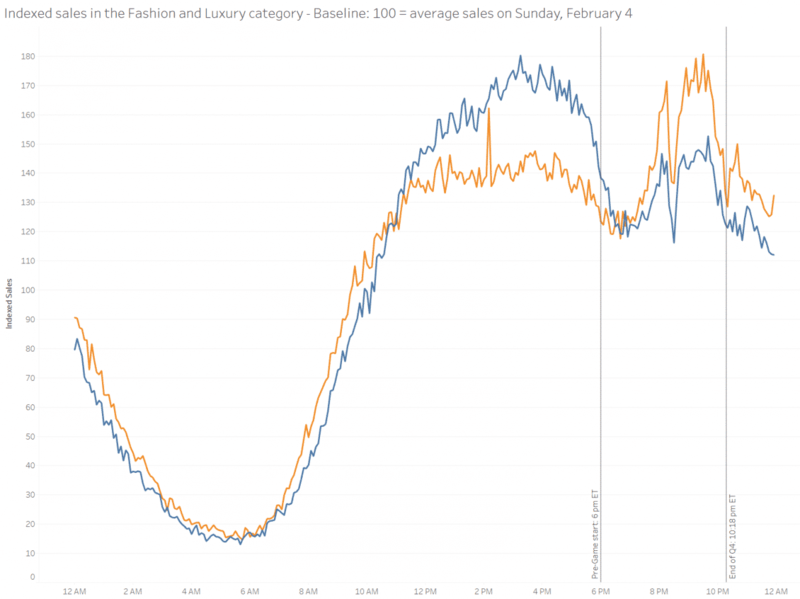 Compared to average on Sunday in January, sales soared before the pregame festivities began at 6pm ET. Stocking up on classic game-day groceries like chips, dips, sodas, and beer are among lots of last-minute purchases every season. Once the game started, sales dropped and stayed low until the game was over. Baseline: 100 = average sales on Sunday, all retail combined, all devices, excluding apps, January 2018, United States. Based on 22 million transactions completed on 800+ US retail sites, in 24 hours. 2. Couch commerce reigned supreme. The start of the game heavily impacted sales on all devices as football fans stopped shopping and started watching. But fans still shopped from their sofas: mobile was on par with desktop sales the minute the game began, more than making up for the drop in desktop activity. There was an even greater sales dip occurred when Justin Timberlake performed at halftime. We could call this ‘the Justin Dip’ – with a big budget halftime show, everyone stopped to watch what was happening on their main screen. Every year, sports fans also enjoy many of the year’s best commercials — and 2018 did not disappoint. With epic, hilarious, and memorable spots from brands like Doritos and Mountain Dew, Michelob Ultra, Tide, Febreeze, and even Australia (yes, the continent), shoppers were inspired to browse digital shelves for everything from snacks and drinks to CPG and travel. 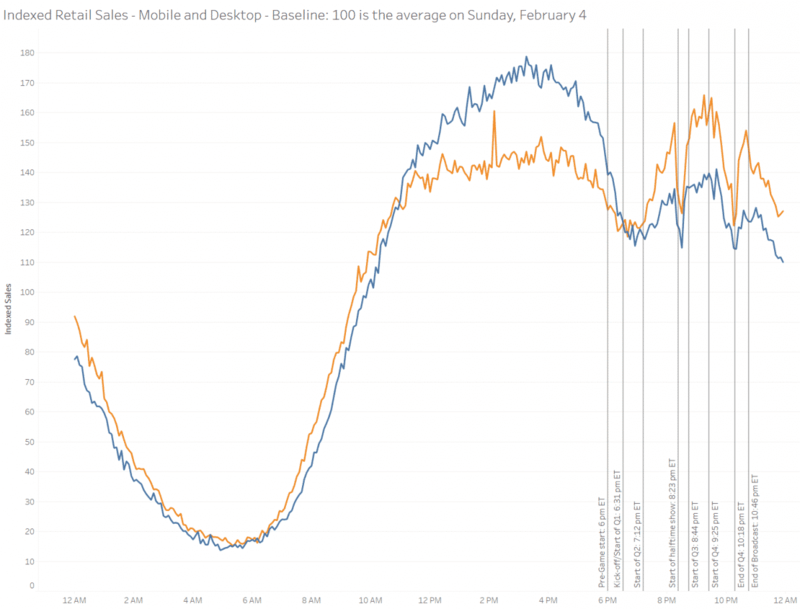 Baseline: 100 = average sales on Sunday, mobile and desktop, excluding apps, February 4, 2018. 3. Sporting Goods rocketed by 422%. Nine touchdowns, five field goals, trick plays, and thunderous glory — who wouldn’t want to be a football star? Apparently, lots of shoppers agree (or at least aspire to be more athletic). 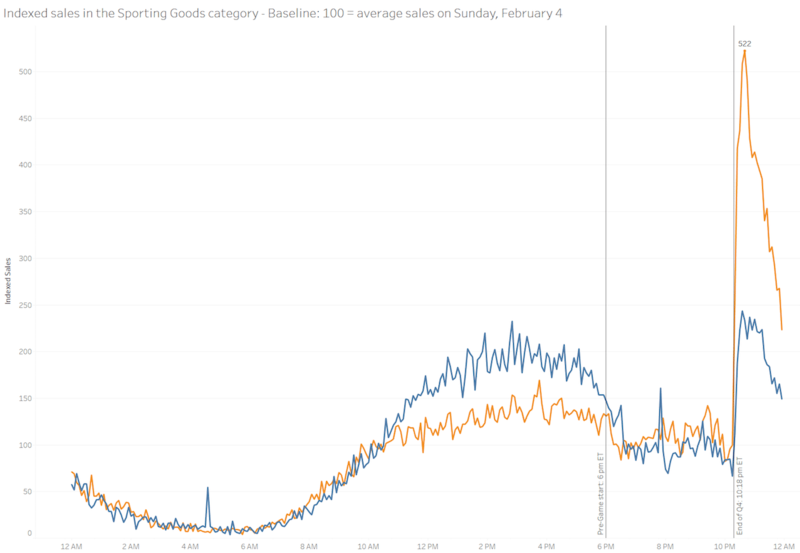 Sales in the sporting goods category surge dramatically just after the end of the show, rising 422% when compared to average the average Sunday in January. Retail is a seasonal world, especially when it comes to particular categories of commerce. It was fascinating for us to see exactly how the Super Bowl affected purchases, especially after the game. As we saw when we dug into our latest Valentine’s Day data, any major holiday or celebration has big implications for retailers and brands. And, as shoppers continue to adopt to mobile screens and mobile shopping, it’s important to remember that, just because they might not be near a computer, that doesn’t mean they aren’t browsing.